As someone who works intimately with metals, I feel you’ll feel me on this: alchemy is real. Often, one must first literally melt down before one is able to be molded into something beautiful. This has been true in the history of running this retreat, just as it has been true in the history of running the internal workings of Being Myself, Inc. The two, I think, are inseparable and each informs and transforms the other. Hence: alchemy. There are also moments that stand out for their ability to shape the future or the essence of a thing. Moments where Resistance shows up like an insistent knight bent on saving you from your magnificence. It’s so very hard, but the act of moving towards your heart instead of against it creates a ripple of magic. These are the forges of entrepreneurship. In the case of building Nurture, there have been opportunities to compromise my integrity; believe in lies; give up; get distracted by hype; drown in my own insecurities. Some of these opportunities have been as tempting as the lifeguard in How to Make An American Quilt. (Side note: I am dating myself. Side side note: there has probably never been a more Sonja movie made. Side-iest of side notes: if you haven’t seen it, it is worth it for the strawberry scene alone.) The alchemy of staying true to myself has meant that, in the moments I have least expected it – when all is mush and uncertainty and surrender – signs have appeared to let me know I’m on the right path. I created this custom ‘Nurture’ Love Necklace for you all to wear this weekend and forever! 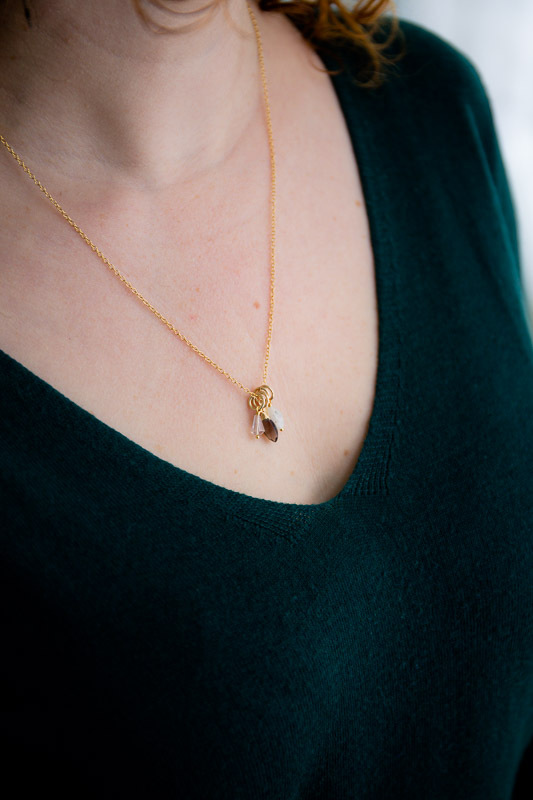 Strung onto a gold-filled chain you will find 3 carefully-chosen wire wrapped healing stones and a leaf charm. These beautiful stones have the qualities that we ALL need to navigate through our lives! I still can’t really find the right words to say how much your gesture of generosity meant to me, or the levels on which it resonated and encouraged me. It also challenged me: on some level your offering was an invitation to align with the magic of my own offering. You see, I have spent years in various levels of energetic apology when it comes to Nurture, thinking that if I only infused the experience with enough love and attention to detail, then people would consider it something worthwhile to attend; be involved with; contribute to. I payed a lot of money and devoted an inordinate amount of extra time to ensuring it would appeal, forgetting in the process the inherent worth and incredible power of an offering that is crafted by someone who is following a calling of the heart to create it. It should come as no surprise that this is also how I felt about myself, reflected outward, through my business. I was spending so much time filling other people’s cups, I didn’t even see mine was empty, equating the sacrifice as honourable. 2018, however, was a year where the alchemy forced me to change. Feeling exhausted, defeated and – I’ll be honest – hurt by the ways in which I realized I was engaging in expensive dynamics disguised as my own generosity. I saw my systems were set up as a plea to ask others to confirm something I already knew in my deepest of hearts was incredibly magical and had changed the lives of the people it touched. I experienced a kind of rage. Let’s call it the rage of my own nurturing Self, finally fed up with the cost of maintaining this lie: the lie that Nurture (that I) needed to spend anything extra (time, energy, money) to ‘win’ people over. I could instead do that by both being more, and paying more loving attention to, myself and have people resonate with THAT, or move on. I implemented systems and boundaries and balanced the scales of some personal and professional dynamics; I invested in my business by getting help where I felt stuck (I shout from the rooftops in praise to you, Steph Pellett); I ate a lot of chips with friends in the murky in-betweens. a) retreat into anxious, impostor syndrome fear because I offered you something so incredibly valuable and you don’t believe you earned it? b) will you humbly accept this as a sign of your resonance because I offered you something so incredibly valuable and it feels aligned because maybe you finally believe you ARE it? Thankfully, and not without some deep breathing, I chose the latter and everything shifted. * I cannot thank you enough for inspiring this moment. *Cue retrospective medieval fanfare. Obviously it’s a smug lone trumpeter in full regalia. I also cannot thank you enough for your beautiful necklace. I wear mine every day and get a sweet thrill every time I see one adorning the necks of our Nurture gals. It means something special to each of them, and for that, too, I am grateful. Your Nurture necklace for some has become a place to store the memory of our potent shared weekend. Others proclaim it to be “the exact necklace they didn’t know they needed in their collection” that they now wear often. For me, it remains a literal touchstone. I wear it as a daily reminder that when we contribute (energy, love, attention, funds, devotion) in a way that honours both our gifts and our boundaries, it inspires others to share their own. Thank you, deeply, for sharing yours. I will not forget it.